Become a medical assistant with PRINCIPLES OF PHARMACOLOGY FOR MEDICAL ASSISTING, 6E! Written by a seasoned instructor to meet the specific needs of medical assisting students, this book leverages current health care standards to explore common practices, procedures, medications, and drug preparations, explaining concepts in clear and easy-to-understand language. For deeper focus, graphic icons throughout the readings point out important issues such as legal implications, safety in administering medications, warnings and cautions, medical documentation, ethical considerations, and patient teaching. 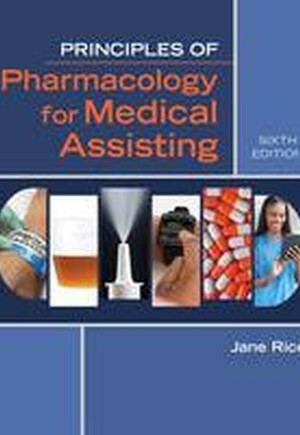 Designed to help you succeed in your course and beyond, PRINCIPLES OF PHARMACOLOGY FOR MEDICAL ASSISTING, 6E also includes special learning features such as spotlights on key topics, discussions about special considerations for older adults and children, critical thinking questions and activities, spot checks for self-testing, and much more! SECTION I: MATHEMATICS AND DOSAGE CALCULATIONS. 5. Calculating Adult Dosages: Oral and Parenteral Forms. SECTION II: INTRODUCTION TO PHARMACOLOGY. 7. Drug Sources, Schedules, and Dosages. 8. Forms of Drugs and How They Act. 11. Administration of Nonparenteral Medications. 12. Parenteral Equipment and Supplies. 13. Administration of Parenteral Medications. SECTION III: MEDICATIONS, SUPPLEMENTS, AND DRUG ABUSE. 16. Antifungal, Antiviral, and Immunizing Agents. SECTION IV: EFFECTS OF MEDICATIONS ON BODY SYSTEMS. 21. Medications Used for Musculoskeletal System Disorders. 22. Medications Used for Gastrointestinal System Disorders. 23. Medications Used for Cardiovascular System Disorders. 24. Medications That Affect the Respiratory System. 25. Diuretics and Medications Used for Urinary System Disorders. 26. Medications Used in Treatment of Endocrine Disorders. 27. Medications That Affect the Nervous System. 28. Medications That Affect the Reproductive System. Appendix A: Alphabetical Listing of Websites for Additional Drug Information.